If you have CSF firewall installed in cPanel you might noticed that you’re getting an email every time some process (usually a php script) uses more than 250MB of memory (default value) or more than 1800 secoonds (also default value). These emails are being sent by LFD service that sends excessive resource usage alerts to the email address which is assigned to it, normally to root user account. This notification points out a particular process or service using excessive server resources and helps in identifying the resource eating process/service. We can either kill/stop the process/service to free the resource or allocate more resource to it, if necessary, increase the limits or simply do nothing and wait for it to finish it’s work. This method will permanently disable the LFD excessive resource usage alert and you won’t receive any more emails. Performing this method could pose a a potential security/stability issue (you have been warned! 🙂 ). 5) Modify the value of directives PT_USERMEM and PT_USERTIME to 0. We will increase the values of both memory and time to stop or minimize the LFD alerts. If any process/service uses more resources than defined, you will still continue to receive the LFD alerts, but hopefully less. 5) Modify the value of directives PT_USERMEM and PT_USERTIME to desired. Save the changes you have made and restart CSF+LFD. By doing any of these two methods above should result in getting less or no email alerts from LFD. I use just-ping.com when I need to ping my servers from various locations in the world to see if it’s working right. I have noticed that when CSF Firewall is installed and active I get losts of lost packets when trying to ping the server, but when I disable it – results are okay. The solution for this is to increase the ICMP_IN_RATE value from 1/s to 30/s. 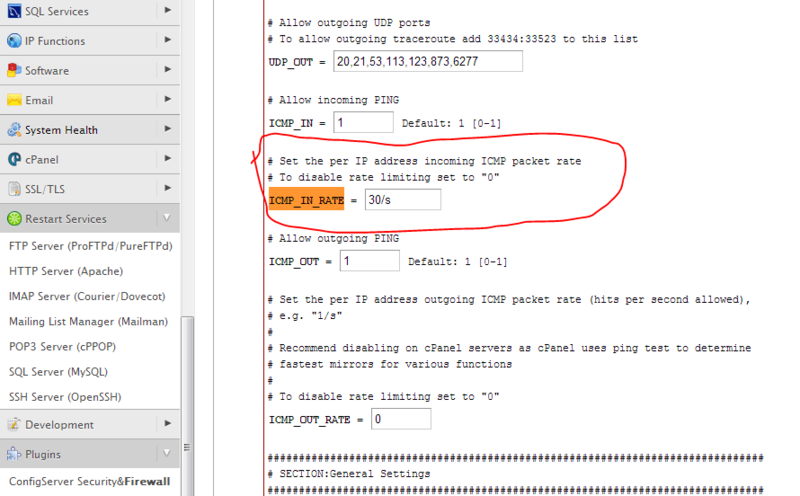 To do so login to your WHM go to ConfigServer Security & Firewall and there click on Firewall Configuration button and on that page locate ICMP_IN_RATE (CTRL+F can help you locate it) and then increase it’s value from 1/s to 30/s. Scroll all the way down and pres “Change” button to save the changes. Restart the firewall and test it again. 04.12.2014 Update: Looks like the just-ping (now on new address cloudmonitor.ca.com) changed the way their service works. Now they ping you instantly from all places at once and CSF firewall will block most of these out and you’ll get lost packets in report. 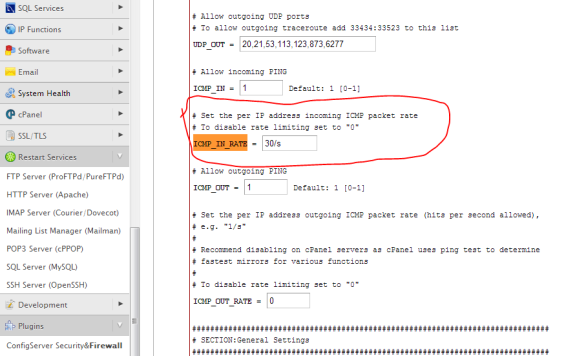 So for the testing you should set ICMP_IN_RATE to 0 – that will disable it – and then you can do tests. Other way around it to set it to fairly large number (200 or even bigger). Don’t forget to restart CSF + LFD in order these changes to apply.